According to a recent Gallup poll, companies with a high rate of engaged employees rates are 21 percent more productive. So, that leads us to the idea that having employees who are happy and committed to their work is an essential part of your company’s long-term success. Working to increase employee engagement can help to decrease turnover costs while boosting efficiency and productivity. Now that we’ve made the case for paying attention to engagement, it’s also vital to mention that a failure to focus on what your employees need will put your company in a compromised position, far more so than any competitor or shift in the market. A Darwin Survey performed a few years ago found that the most important factor in employee loyalty and engagement was confidence in leadership. Employees want to feel like they are being managed by someone who has vision and experience. The best way to make yourself a better leader is by striving to improve your skill set and industry knowledge. Some leaders try rest on their laurels, which can lead to big problems. Continuing your education and staying up-to-date on developments within your industry can make your company stronger and your engaged employees more productive. In short, your company’s culture is a combination of how you interact with your employees and how they interact with each other. Your job as a leader is to keep your finger on the pulse of your company’s culture. When you have to address interpersonal problems within your company, avoid “meddling” in the personal affairs of your employees. Being completely objective and professional can help you avoid showing favoritism when issues like this arise while you are trying to create engaged employees. Remember that a solid culture is built on trust and consistency, and that providing your leaders – those who interact with employees daily – with ongoing training can inspire the exact kind of engagement you’re looking for. One of the most common sources of employee frustration is a lack of training. This is crucial in the early days of employment, and a well-thought out onboarding process is a large part of future engagement. If an employee feels like they have not been given the knowledge or tools needed to do their job correctly, they will start to seek other employment opportunities. In fact, the Work Institute reported that 34% of turnover occurred in the first year of employment. 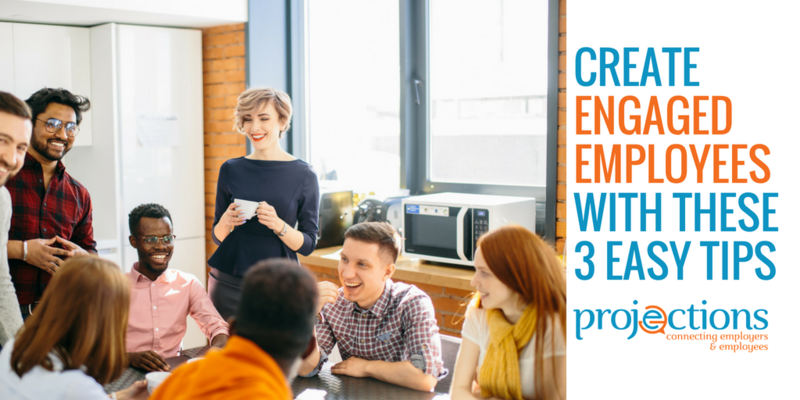 Focus on providing ongoing training to create engaged employees. Vary the medium to engage today’s employees, and take advantage of online video and highly interactive eLearning. Custom solutions are often the best choice when you want to create greater employee engagement while building your company’s best culture. Next-level engagement solutions for your company may incorporate social media, dedicated websites, shareable content and video, and even continuous feedback loop solutions such as warble and 15five. Looking for ways to connect with your employees? The team at Projections offers custom video, websites and eLearning, specifically crafted to engage and inspire employees! For over 40 years, Projections has helped employers just like you keep their teams engaged and productive, helping companies create a UnionProof culture from day one, and a reputation as an employer of choice!